The weekend competition today features a volume by one of the most popular Contemporary pedagogical piano composers, Pamela Wedgwood. Pamela has written a substantial amount of piano music at all different levels, with many pieces included in various exam board syllabus’ and festival classes across the world. Those familiar with her style will know Jazzin’ About and Up-Grade! as well as the After Hours series. My competition prize is a copy of Pamela’s On My Travels from the After Hours series, which was published earlier this year by Faber Music. It’s intended for those of around Grades 6-8 or intermediate to advanced level, and was inspired by people and places visited by the composer. The collection consists of evocative titles such as Thetis Island, Chez Kate, The Spirit of Pohutukawa and Abel Tasman, and each piece provides plenty of melodic and harmonic interest for pianists. To win this copy, please leave a comment in the comment box at the end of this post and I’ll select the winner on Sunday evening (British time). Pamela Wedgwood will be giving a workshop (and adjudicating the EPTA (European Piano Teachers Association) composer’s competition) on Saturday November 7th which is being held at Monkton Combe Senior School, Bath, BA2 7HG, UK. This will be a wonderful opportunity for all budding composers. Presented by EPTA UK, the workshop is free to attend, and there are still a few places left for both participants and observers. You can purchase your copy of On My Travels, here. I’ve always been a fan of Pamela Wedgwood’s music and my son has also played her After Hours for saxophone. How exciting to have a new book with titles such as The Spirit of Pohutukawa (NZ Christmas Tree) and Abel Tasman who was the first European to “discover” New Zealand in 1642. There is also a national park in NZ which was named after him. It would be great to try this new music. Thanks for the opportunity. These sound lovely! I’d love to win a copy. Thank-you! This looks just delightful! Thank you for this post. I think my adult students especially will love this! This would be a perfect addition to my pam collection! My pupils love her music. Lovely music. I’d love to win a copy. I’d love to introduce this music to my students. 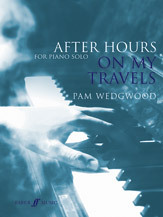 I really enjoy teaching Pam Wedgwood’s pieces and I’d love to share the music from this book with my students. Would love to win this music and introduce it to my students!